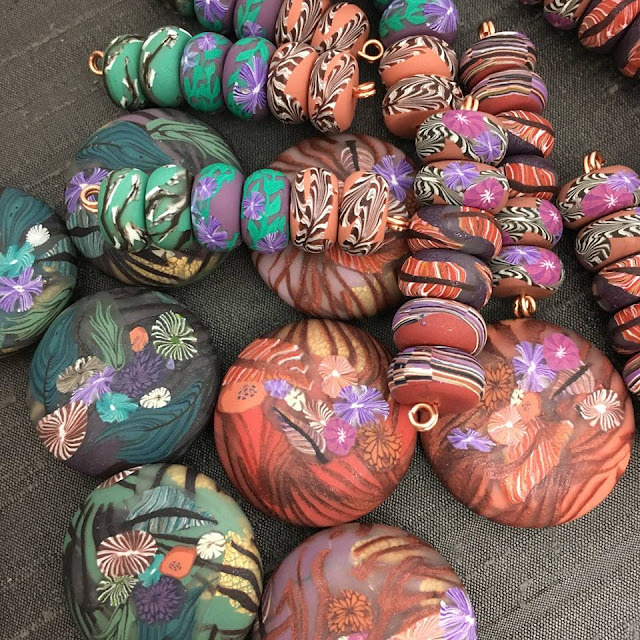 Art Bead Scene Blog: I Took the Art Bead Scene Challenge! I Took the Art Bead Scene Challenge! beautiful color palette was my starting point for the birds above. I mixed each of the colors in the palette and decorated my birds with island inspired flora. My second go-around with making beads for the challenge I went a little more off onto my own with colors but wanted to capture the same wild feel of the landscape. How are you doing with the challenge? Have you pulled through your stash and started creating? Join in the fun. In case you missed the challenge here are the details. You can find my lentil and disk beads in my Etsy shop. wow. nailed it. love the island feel! Heather, your eye for color is amazing! Love seeing how you interpret these challenges. I think these are some of my favorite Humblebirds ever, Heather! Gauguin's work is some of my favorite, and it's perfect interpreted on your beads!